Autumn is already here and the thoughts of BGS past pupils are beginning to turn to the Bangor Dinner, which will be held at the Marine Court Hotel on Friday 9 November. 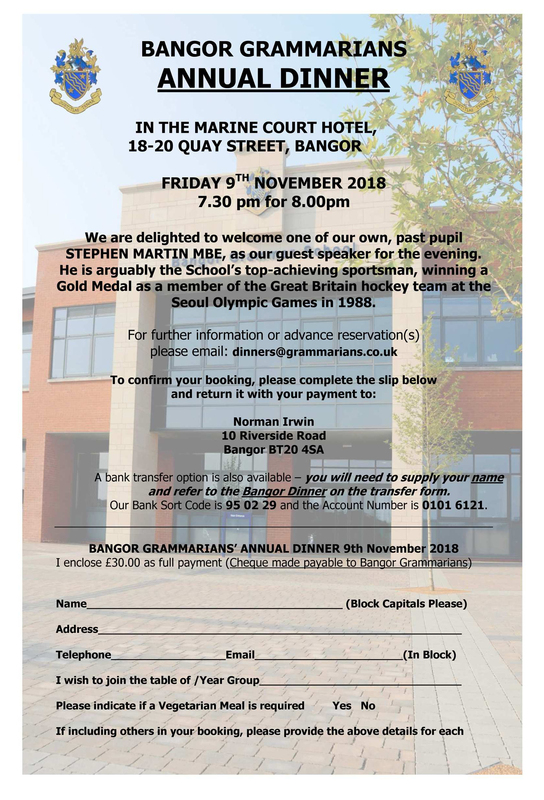 Our special guest this year is Stephen Martin MBE, arguably the School’s top-achieving sportsman, winning a Gold Medal as a member of the Great Britain hockey team at the Seoul Olympic Games in 1988. All the details are on the attached flyer, which can be copied and printed out. It will also be distributed with copies of the 2018 Grammarian. The annual magazine has been printed and we hope to have all copies delivered (plus the digital edition) to our members before the end of September.